Call 911 if You Are Lost or Injured. How are Search & Rescue Members Alerted of a Mission? Yes we do; however, volunteers are not asked to do anything they are uncomfortable doing. What is your most common rescue? Do we have to wait until it is a life or death emergency to call Search & Rescue? No. Call when you suspect there might be a problem. We can then get help to you faster. Who do I call if I get lost or injured in the wilderness? Call 911. They will contact the Sheriff’s Office Special Services. How long do you wait until you go looking for someone? Immediately. Once it has been determined that someone is missing, injured, or can’t get out by themselves, we page out for SAR resources immediately. There is no 24 hour waiting period. Do you guys do searches and/or rescues at night? Yes, we go as soon as we know there is an emergency. How much does it cost for you to rescue someone? Search & Rescue does not charge for its services. However, if other services are needed, such as AirLink or hospitalization, we have no control over what they charge. What skills are necessary to be a volunteer? SAR is a demanding and disciplined volunteer commitment. You must be comfortable in the outdoors, physically fit, flexible and be committed to participate in missions at any time or under most conditions. I want to volunteer, but what if I’m busy and can’t make it to some things? Search & Rescue is comprised of people in all stages of life. Some work full time, while others are students or are retired. We don’t expect you to make it to everything, but we do have a minimum requirement of 100 hours per year in which 30 hours of that is required training along with responding to a minimum of 6 missions a year. 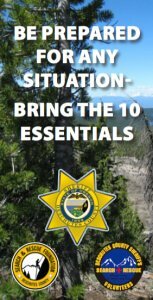 Fill out an application with the Deschutes County Sheriffs Office. The application period for 2015 has closed. Applications received will be considered for 2016. Once accepted you must complete a 100 hour Search & Rescue Academy and pass a written test and demonstrate numerous proficiencies prior to being certified. You are then required to put in a minimum 100 hours a year including 30 hours of training, 6 missions and public events. If accepted into the Academy, you pay $100 that pays for your required clothing items. What type of certification process is there to be part of a specialty team? After completing the Academy, participation in advanced skill teams is dependent on interest, ability and availability to train with that team. Most specialty teams have 3 or more levels of certifications, Beginner, Intermediate, and Expert. Some levels require passing a written, physical, and/or practical test. You must have a valid Oregon Driver’s License. Other than that, it depends on what teams you decide to join. If I don’t feel comfortable doing something on a mission, do I have to do it? No. Everyone on the mission is responsible for the teams’ safety. If you do not feel comfortable or right about doing something, simply let the person in charge know. Thank you for your consideration! To make a donation to Search & Rescue, please visit our Donations Page.